Ciao Pittsburgh is western Pennsylvania’s longest-running online magazine covering all things Italian. We showcase delicious Italian cuisine, successful Italian-American business owners, our great local culture, traditions that have been passed from generation to generation, and more. Our goal is to inform, educate, and entertain Italian-Americans living in the Pittsburgh region and beyond. Through this online publication and our social media networks, we publish our own news stories and feature regular guest experts. We are also advocates for Italian-Americans, providing effective editorial materials to support the Italian lifestyle and traditions on a regional and national level. In addition, Ciao Pittsburgh provides our network of readers and the people we feature with a platform to connect and unite with other Italian-Americans. Each month, we highlight the people, places, traditions and events among the Italian community with in-depth features and articles. Are you reading this on a mobile device? We modernized this website to incorporate responsive web design to adjust the site’s layout to display optimally on any device—desktop and laptop computers as well as on tablets and smartphones. Finally, we believe in journalistic integrity. This means always being open and honest with you, our readers. We produce our own original content and in cases where the content is user-generated, we always give proper attribution to the original sources of content, whether it’s images, videos, or articles. Not only are we recognized locally, but nationally as well. We were honored to have been recently featured in a new National Geographic book. For more information about our Italian Pittsburgh magazine, please contact Jack De Leonibus, our publisher, at jack@ciaopittsburgh.com. As founder and publisher of Ciao Pittsburgh, Jack strives to give his readers an insightful glimpse into the Italian-American culture through eclectic coverage and meaningful dialogue. 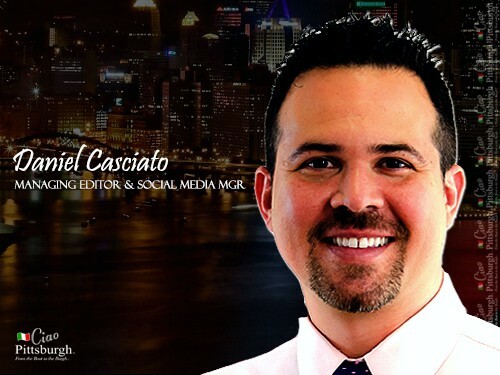 More than just an online publication, Jack hopes Ciao Pittsburgh provides a unique forum where Italian-Americans from all walks of life can share their storie (stories), patrimonio (heritage), and esperienze di vita (life experiences) with his readers. In addition to overseeing the editorial direction and long-term strategic initiatives, Jack is also responsible for building and maintaining long-term, profitable relationships with our advertisers. While he’s ‘old school’ at heart and in tradition, Jack also possesses a ‘new school’ entrepreneurial attitude. This has led him to diversifying our brand through the development of La Famiglia Espresso Blend and Aroma Italian Seasoning. Jack is married to Stephanie and they have three children—Victoria, Nevio, and Romina. He’s originally from Pittsburgh’s Little Italy, Bloomfield, and currently lives in the North Hills area. Daniel is a freelance writer and social media consultant who has 20 years of journalism experience. He has been editing for Ciao Pittsburgh since January 2012. He quit the 9-to-5 full-time gig back in 2007 to start his own writing business. He often writes about healthcare, social media, science and technology, commercial real estate, emergency medicine, health and lifestyle trends for consumer and trade publications. Additionally, Daniel consistently writes good, crisp copy that helps clients sell products and services to their customers. His experience includes copywriting for an award-winning interactive web design agency and full-service integrated marketing communications firm. He loves his hometown of Pittsburgh and is a diehard Steelers, Penguins, and Pirates fan. Along with three friends, he co-founded the Pittsburgh Sports League, a coed recreational sports league in 2000 which now attracts over 15,000 participants a year. Occasionally, when the mood strikes, Daniel dabbles in amateur filmmaking. Along with his friend, Christopher, he started Two Guys from Italy Productions. To view his entire portfolio, visit www.DanielCasciato.com.